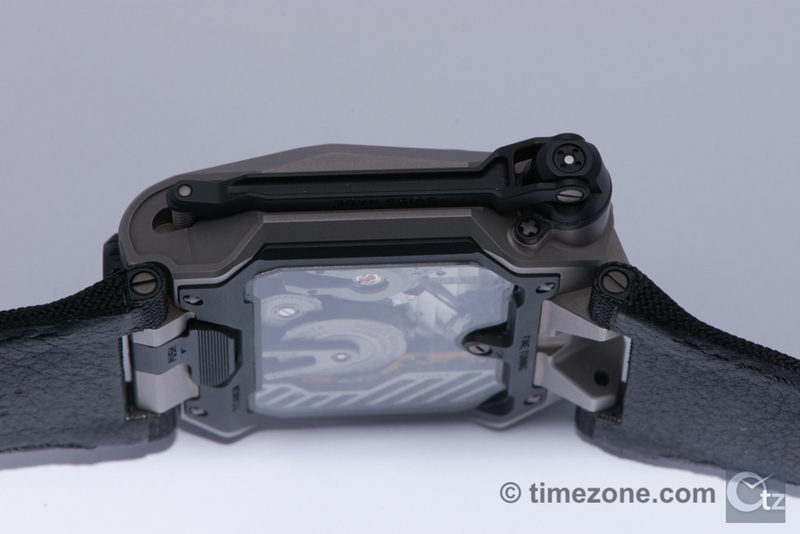 During SIHH 2016, URWERK presented its remarkable EMC Time Hunter, a fully 100% mechanical watch enhanced with electronic indications that allow the owner to gauge both the state of the movement and its chronometric performance. 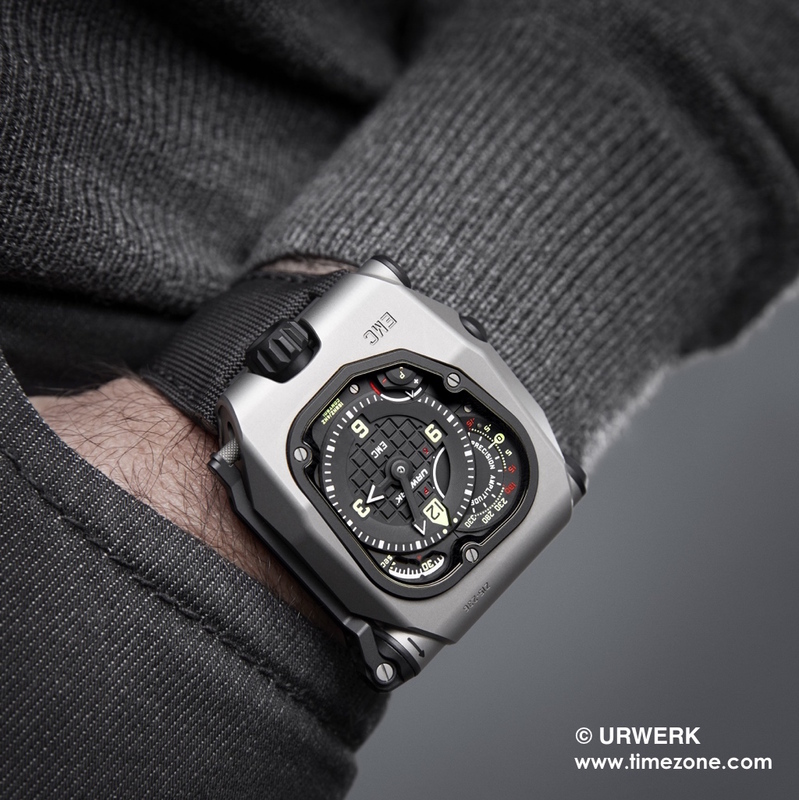 As a world first, this new EMC incorporates a Witschi-like measuring instrument that enables its wearer to monitor both the health (amplitude) of the watch and its precision as worn on the wrist. Not only does the EMC enable the owner to obtain reliable and accurate data at the touch of a button, the owner can also make fine adjustments to the timing so that the watch is tailored to the owner's specific lifestyle. The highly legible time display features a central hours and minutes indicated by high-contrast black hands treated with white Super-LumiNova. 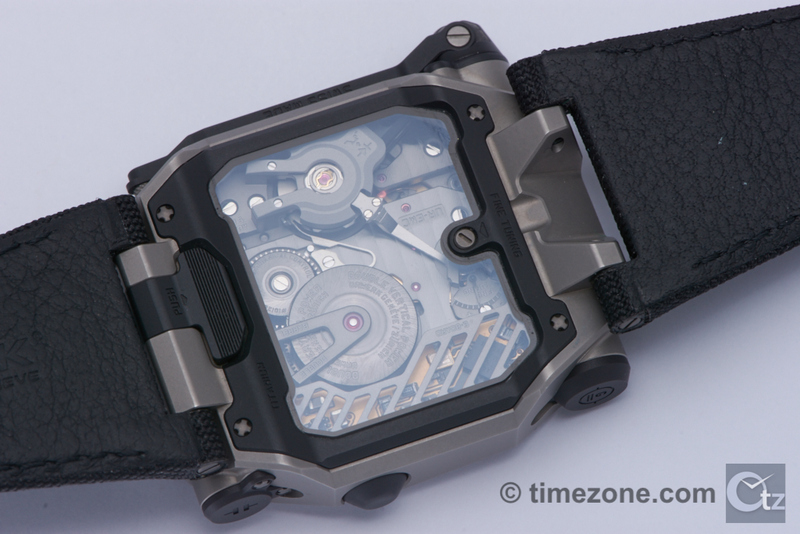 A rotating disk displays seconds at 1 o'clock and the power reserve indicator is located at 7 o'clock. The Super-LumiNova glows in blue and white. The dial in the top left corner at 10 o'clock displays the two EMC electronic indications: timekeeping precision to +/- 15 seconds per day and the amplitude of the balance. Turning the EMC Time Hunter over reveals the fully in-house manufacture movement with integrated circuit board, the top of one of the two mainspring barrels near the crown, and the top of the balance wheel and optical sensor on the winding handle side. 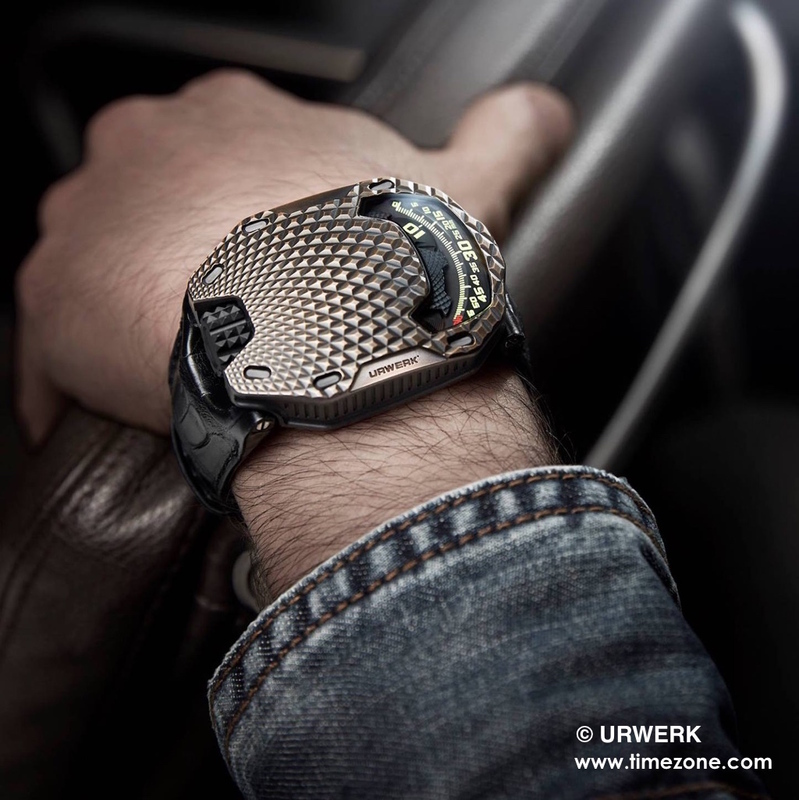 The Caliber UR-EMC2 is in-house movement is conceived, developed and crafted in the URWERK ateliers in Zurich and calibrated by URWERK in Geneva. The movement meets the most stringent quality control, with its chronometric performance tested in five positions during a 30-day cycle to ensure that it meets the highest standards for a precision watch. The timing adjustment screw is accessible on the back of the watch and allows the owner to make very fine adjustments to the balance rate regulator by changing the active length of the balance spring by simply turning a screw. 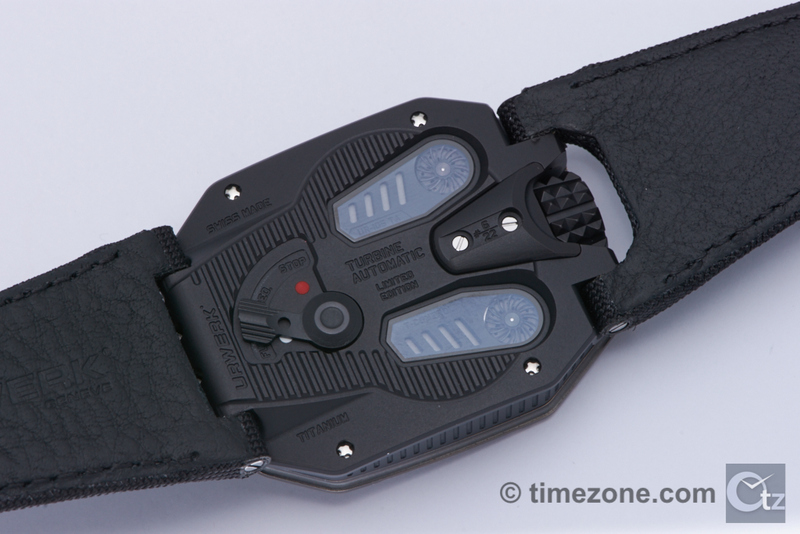 This allows the user to adjust the timing to suit the pace of the owner's lifestyle. To operate the EMC indications, first the fold-out crank handle is wound to generate power for the high-precision micro motor. There are no batteries, but rather winding the crank generates power that is then stored in a super capacitor that drives the micro motor. 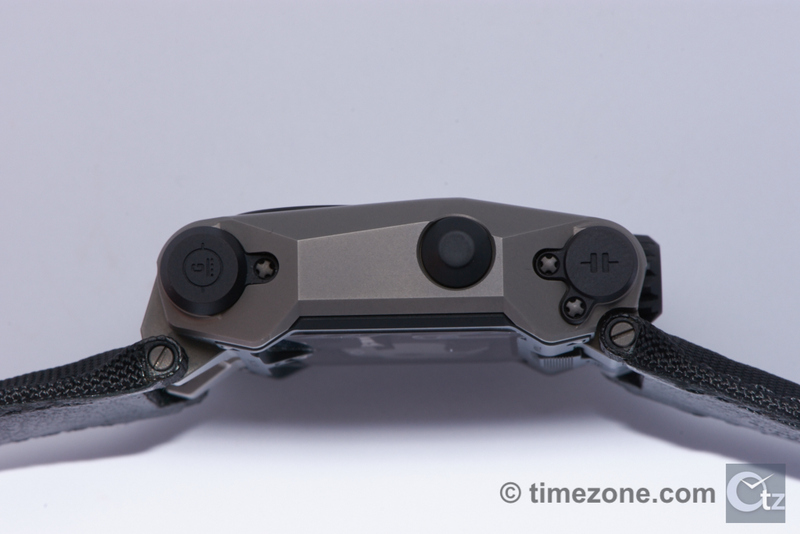 The micro motor then powers the hands that indicate either δ (processing underway) or P (not enough power), then the movement's precision to +/- 15 seconds per day, followed by the amplitude of the balance. The EMC system also utilizes precision optics to display a green LED light if accuracy is achieved, or a red LED light if one or both of the EMC indications fall outside acceptable parameters. Olivier Evale developed the software behind the precision optics to achieve an accuracy that is better than 10 microseconds. The EMC system is further built with a high-frequency 16,000,000 hertz reference oscillator with an extremely long life that only loses 3 parts per million over a full year. In addition, the high-precision micro motor is fabricated by the Swiss company Maxon, which has been fabricating high-precision systems for automative and aeronautical industries since the 1960s. The super capacitor of the micro motor is extremely reliable and can be charged/discharged 100,000 to 200,000 before losing any performance. 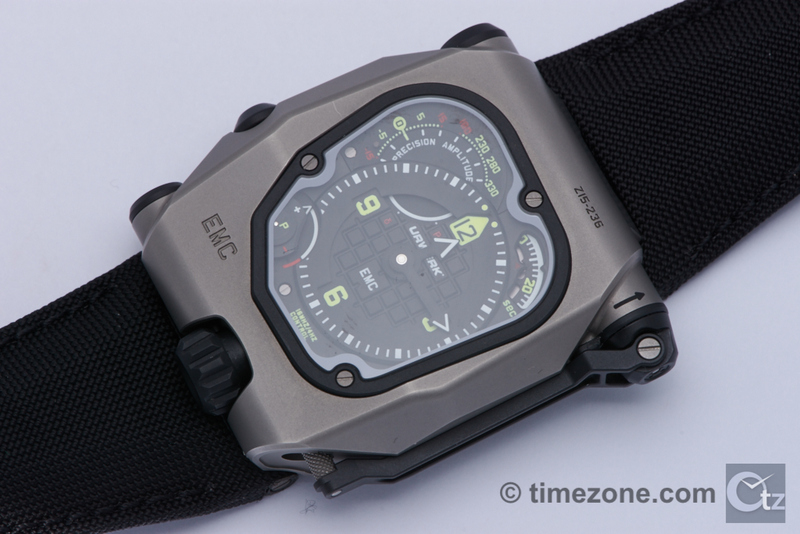 The EMC Time Hunter is available in two limited editions of 15 pieces each. 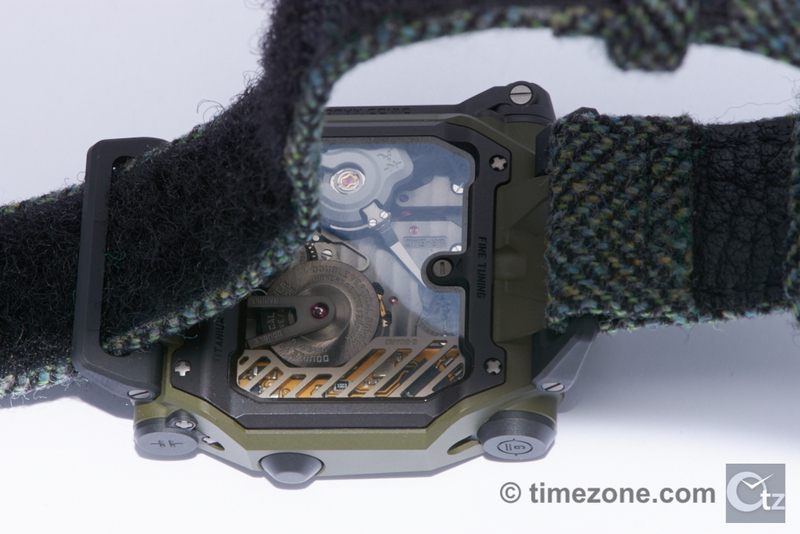 One edition features a Grade 5 natural titanium/steel case and the other a military green ceramic-coated Grade 5 titanium/steel case. 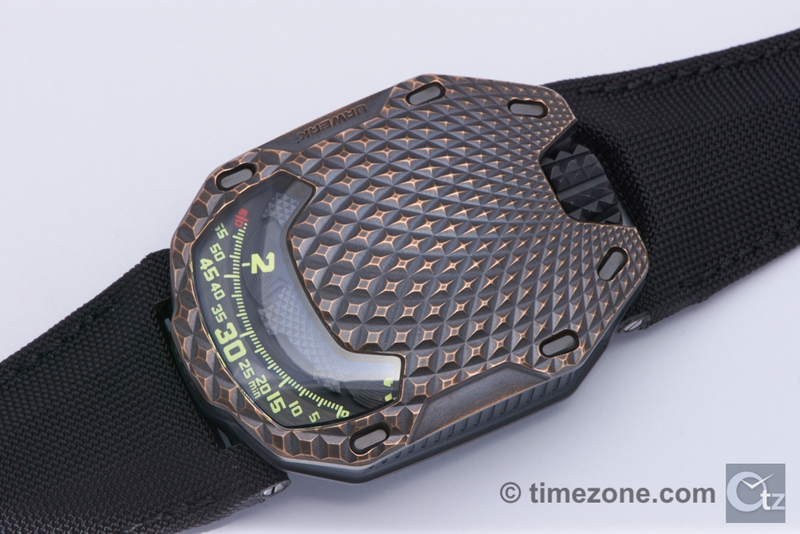 The case measures 43mm x 51mm length x 15.8mm with satin and bead-blasted finishing. 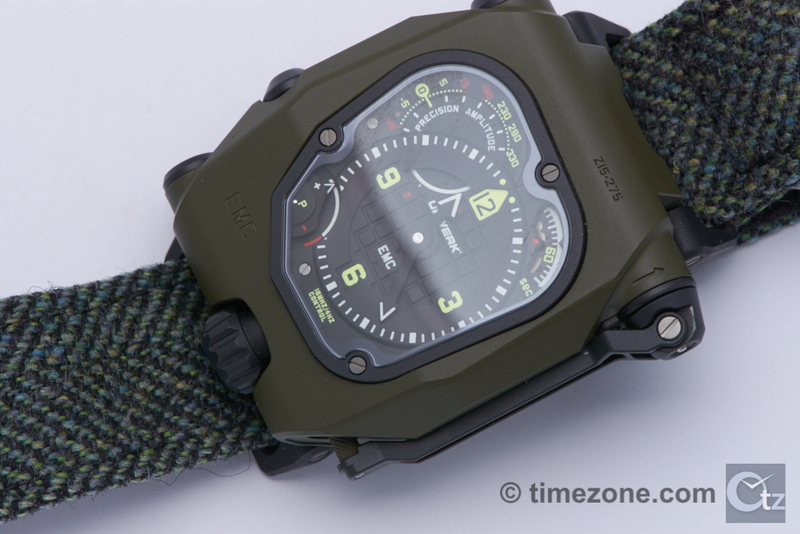 Price is 110,000 CHF for the natural titanium/steel and 115,000 CHF for the military green ceramic-coated titanium steel. 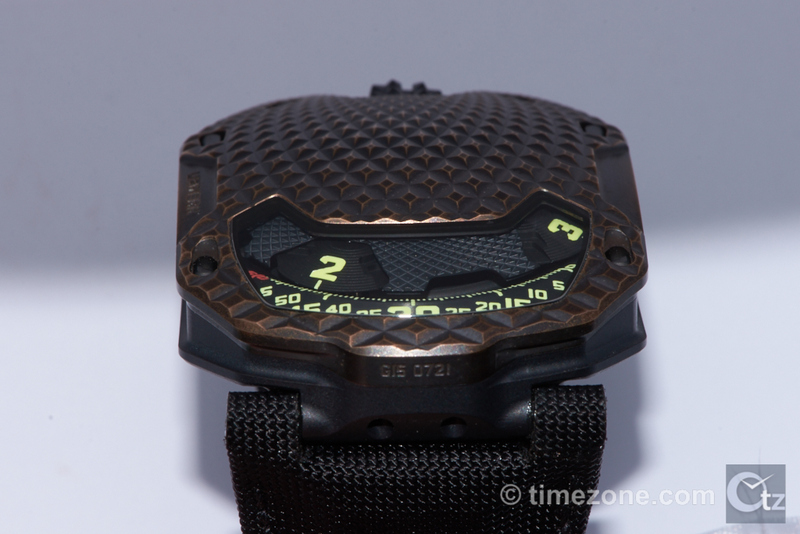 URWERK also presented its dramatic UR-105 T-Rex, named after the Tyrannosaurus rex for the raised texture of its patinated bronze case. Each UR-105 T-Rex is treated as one-of-a-kind since they are are all individually decorated with a raised, concentric pattern; then finished with bead blasting and micro-sandblasting; purified; and finally oxidized by hand with a brush. The bold case frames the firm's iconic satellite hours that wander along the minutes rail on the dial. The orbital structure of the Caliber 5.02 UR automatic movement is concealed by a polyetheretherketone cover that is decorated with a concentric guilloché motif that complements the case. The satellite hours are crafted in beryllium bronze. The carousel and triple mainplates are crafted in ARCAP, a copper, nickel and zinc alloy that protects the timepiece from magnetism. Available in a limited series of 22 editions, price is 65,000 CHF.